This week TAM released a Request for Proposal allocating $25,000 to study whether Marin is suitable for a bikeshare system, and where it should go. If Marin eventually does develop its own system, it will join Montreal, London, Paris, New York, Minneapolis, and many other cities in implementing such a system. The RFP itself is not terribly interesting, though you can read it if you like. It’s also not terribly intriguing that TAM is investigating bikeshare, as the authority has a history of investigating a wide variety of projects, no matter the project’s feasibility. What is intriguing is that this comes as the Bay Area Air Quality Management District (BAAQMD) is preparing to launch a bikeshare system with San Francisco, San Jose, Mountain View, Palo Alto, and Redwood City; as SMART is under construction; as the Plan Bay Area gets into full swing; and as a bikemaggeddon is preparing to land in Sausalito with the America’s Cup. Each of these could push bikeshare to the front of Marin’s mind and make it likely the system will actually be built. What the devil is bikeshare? 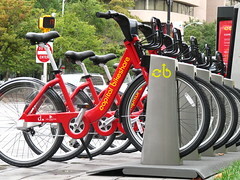 The first successful system in the United States was Washington, DC’s Capital Bikeshare, or CaBi for short, and it’s been replicated across the country since its rollout in 2010. Subscriptions are fairly cheap: $7 for a day, $15 for a week, $25 for a month, and $75 for a year. A subscriber takes a bike out of a station and can dock the bike at any other station. The trip is free for the first 30 minutes but there’s a fee if the bike is out for longer. Although it starts fairly nominal, the fee increases quite a bit once a trip goes longer than an hour. The point is to get the bikes circulating, to replace single trips that might be too short for transit or too long on foot. DC’s tourists use the system all the time, and it’s quite common to see families riding along the National Mall atop the striking red bikes. DC’s residents, including me, use the system all the time. Riding a bike in the city is just as fast as using a car and, for short trips, faster than taking the subway. It keeps me active, pays for itself after a month’s use, is flexible and efficient. It reintroduced me to bicycling and opened the city in a way the bus and metro never had. Now neighboring cities are clamoring to join the CaBi system, while neighborhoods in DC are constantly fighting for new stations. Not to say that CaBi doesn’t have problems. Bikeshare depends on users circulating the bikes around from station to station. Nothing’s worse than finding an empty bikeshare station when you want a bike or a full station when you need to park (you can get your time extended if the station is full). Stations, therefore, need to be tightly packed so that if one station is empty or full, the next one isn’t too distant. In Paris, the stations are sometimes no more than a block apart and don’t dissipate into the suburbs – there’s a hard boundary. In DC, the stations are rather further spaced apart, which works reasonably well though being “dock-blocked”, as its known, still happens with maddening frequency. The city contracts with a company to manually move bikes from full stations to empty ones, but it’s not quite enough. A more decentralized city would mean less strain on certain stations as people commute, but barring that more stations, bikes, and members would go a long way to improving circulation around the system. System overview. Click for PDF. BAAQMD is spearheading the San Francisco plan to establish a bikeshare system in the northeastern quadrant of the city and in isolated pockets along the Caltrain corridor. Its centerpiece is the downtown San Francisco segment, centered around Market Street, which will include 500 bikes at 50 stations spaced 300 yards apart. It’s set to open this summer, just in time for the America’s Cup, which will bring a flood of tourists to the city – tourists that will undoubtedly flock to bikeshare. The San Francisco pilot area. Click for PDF. The District argues that bicycles can function as an extension of the transit network, but transporting them on regional transit agencies is discouraged. Bicycles are not allowed on BART during commute hours, and are limited on Caltrain. The Warm Planet bike shop at Caltrain’s Fourth & King depot is over capacity, and transit is largely maxed out around Market during the commute. Marinites face similar problems on GGT’s commuter buses and ferries. Having a bike ready for anyone in the commercial heart of the city (not to mention the other commercial hubs along Caltrain) will give commuters a solution, allowing them to easily transfer to bicycles in the city without the need to fret over getting a bike to and from work. A bikeshare system would also free a commuter to bike to work but not from it, or vice versa, if they don’t want to arrive at either end a little sweaty. This encourages more bicycle use, more transit use, and, therefore, less driving. Marin’s central and southern cities are ideally suited to the bicycle. Commercial districts are close to one another and housing, meaning most residents are well within biking distance of at least one downtown. Bikes are also better suited than the bus to traverse sprawling Novato or Terra Linda and can be a car replacement for most trips elsewhere. Yet Marin is not terribly dense and has fairly mediocre bicycle infrastructure. More than almost any other place, Marin is linear, with valleys branching off the 101 corridor. The ideal grid, with its redundancies and infinite rerouting, is impossible over Marin’s ridges. This isolates communities to their benefit and detriment, and makes cycling more difficult than it is in DC’s suburbs – it’s fairly difficult to ride from Fairfax to Lucas Valley despite the fact that it’s only as far as downtown San Rafael, as the crow flies. Marin is also incredibly car-centric, rendering some of the county’s major thoroughfares entirely inhospitable to bikes or pedestrians. Marin’s employment corridor is Highway 101. Though office and retail exist in the downtowns tucked away from the freeway, the highest density of employment is along that central spine. Those that don’t work along the corridor probably work in San Francisco, also down the corridor. Bikeshare needs strong bicycling infrastructure, to ensure there is a good way to ride from place to place; population density to keep the system running throughout the day; and decentralized commute patterns to ensure certain areas don’t get overloaded as everyone goes to them, or denuded as everyone leaves them. At first blush, Marin misses all three of these criteria, but it’s not enough to convince me Marin is unsuitable to bikeshare. Those well-spread downtowns lend themselves to bicycling, and other systems, like CaBi, have had success in areas similar to ours. I also want bikeshare to succeed in Marin. Beyond the health, environmental, cost, and traffic benefits, bikeshare would reap political benefits for the county’s urban cycling infrastructure. Transportation debates in the county are dominated by the driver’s voice, as most Marinites are drivers first and cyclists second. Bicycle improvements, then, play second fiddle to parking, roads, and other projects that maintain or strengthen our reliance on the automobile. When bicycling does enter the debate, focus is often on its recreational aspects rather than its functionality as everyday transportation. Since bikeshare is unabashedly functional, growing its membership means growing the political base advocating for cycling improvements. I’m excited to see what TAM’s study will show – Marin could reap so many rewards with the system. With luck, the study will recommend the system.